menu title Welcome to Red Hat Enterprise Linux 6.7! Trivial File Transfer Protocol was first defined in 1980, it is a lightweight version of the FTP protocol that has no directory browsing or password capability. Employing UDP rather than TCP for transport, TFTP is typically used to transfer firmware upgrades to network equipment such as routers, switches and IP phones.It is also used to boot diskless computers (PXE). Simple Network Timle Protocol is a simplified version of NTP (Network Time Protocol). They synchronise the time on workstations across a network. 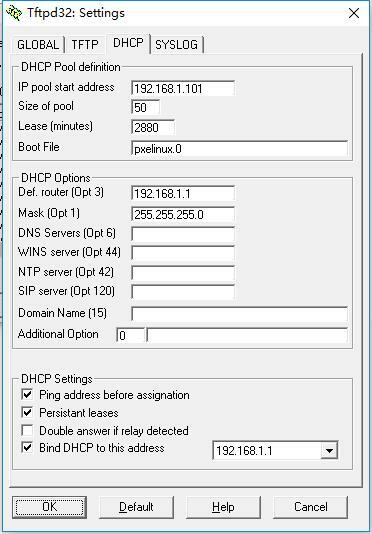 DHCP assigns IP addresses to client stations logging onto a TCP/IP network. It eliminates having to manually assign permanent IP addresses on each station. Syslog is a service for remotely logging data. For example, it allows to monitor videoless network equipments. The default directory used by the TFTP client and server. It may be changed from the main window. 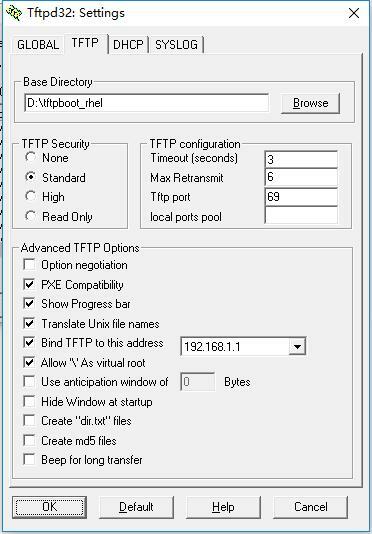 Enable or disable tftpd32 servers and clients. read and write requests are allowed on all disks/directories. read and write requests are allowed but limited to the current directory. idem standard + write requests are allowed only if the input file exists and is empty. idem standard + write requests are rejected. A range of ports (for example 3000:3030). These ports are used for the file transfers. Tftpd32 is able to send packets before receiving acknowledgements. This feature may dramatically speed up the transfer. For each incoming read request, Tftpd32 lists the content of the directory and put the result in a file named “dir.txt”. Tftpd32 sends a beep once a transfer has ended. This is the first address which will be distributed. This is the number of hosts which may be configured by Tftpd32. This is the amount of time in minutes the address is leased for. Used by diskless stations. It is the file which will be retrieved by TFTP to start up the boot process. The strings $MAC$ and $IP$ are pseudo variables which are translated into the MAC address of the client and its assignated IP address. The IP address of the LAN gateway. The network mask which will be assigned to the DHCP clients. The IP address of the DNS. 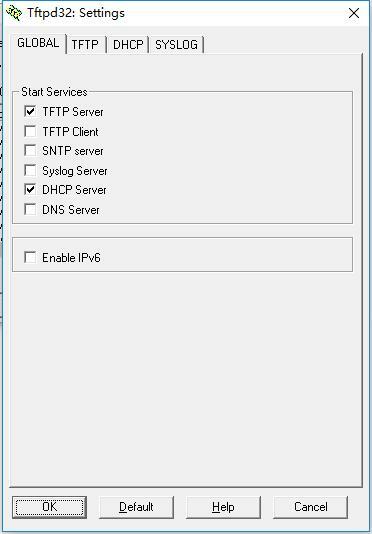 Two DNS can be configured. The IP address of the NTP server used for synchronisation. The IP address of the SIP server. It concerns mostly IP phones. Either the NT domain or the internet domain. Tftpd32 supports up to 10 additionnal options. They have to be configured by editing the tftpd32.ini settings file. Their syntax is similar to the previous one.